Received October 13, 2018; Revised October 17, 2018; Accepted November 9, 2018. In this study, we analyzed the growth characteristics and isoflavone content of 43 soybean varieties highly adaptable to highland areas. The flowering period of each cultivation zone was from July 15 to August 12 at Daewallyeong, from July 18 to August 11 at Jinbu, and from July 23 to August 13 at Gangneung. The accumulated temperature from flowering to maturity was 1,297 °C for Daegwallyeong, 1,391 °C for Jinbu, and 1,685 °C for Gangneung. Forty-three varieties were classified into four utilities; soy sauce and tofu, bean sprouts, cooking with rice, and vegetable and early maturity. The content of isoflavone was highest at 2,579 µg/g in varieties for soy sauce and tofu usage. Five varieties (“Paldalkong,” “Sinpaldal2,” “Ilmikong,” “Sinpaldalkong,” and “Daepung”) cultivated in Daegwallyeong had over 4,000 µg/g of isoflavone. The isoflavone content of the region Daegwallyeong was different at the significance level of 0.1 (p=0.061) compared to Gangneung. There was no significant difference between Gangneung and Jinbu. It is thought that the low temperature of the maturation stage during the growing period affected isoflavone accumulation. The varieties with more than 3,000 µg/g of isoflavone content in Daegwallyeong, Jindu, and Gangneung were “L29,” “Williams82,” “Ilmikong,” and “Daepung.” These were genetically and environmentally stable in isoflavone content. It is expected that this study will be used as basic data for the functional breeding and selection of soybean varieties highly adaptable to a specific region, and to help expand soybean cultivation areas in highlands. 고랭지 지역의 농업형태는 여름철 단경기 재배가 주를 이루며, 작목으로는 배추, 무, 감자를 중심으로 연작재배를 하거나 지나친 비료 투입과 객토 등으로 토양환경이 악화되고 있다. 이에 고랭지 지역의 토양환경 개선은 물론 수익성을 보장할 수 있는 작부체계와 신작물 도입이 시급한 실정이다. 콩은 콩과(Fabaceae) 작물의 한해살이 식물로 씨앗을 주로 이용하며 만주와 한반도가 원산지로 5,000년 이전부터 재배되어 왔다. 콩의 뿌리혹박테리아는 대기중의 질소 고정을 통해 토양을 비옥하게 하여 지력증진과 토양개선에 유용하며 콩에는 영양성분과 생리활성 물질을 포함하고 있어 많이 이용되고 있는 작물이다(Goss et al. 2002, Rodríguez-Navarro et al. 2011, EL-Shemy 2011, O’Keefe et al. 2015). 이소플라본은 페닐프로파노이드 화합물의 하나로 콩의 주요 생리활성 물질이다. 페닐프로파노이드 화합물은 구조적⋅생물학적 기능면에서 그 범위가 넓다. 병원체 공격, 햇빛 또는 UV, 상처, 저온 또는 토양 내 양분부족 등의 다양한 생물학적⋅비생물학적 스트레스에 의해 페닐프로파노이드가 유도된다(Dixon & Paiva 1995). 이소플라본은 항암, 골다공증의 예방은 물론 여성 호르몬인 에스트로겐과 비슷한 분자구조를 갖고 있어 여성 특유의 질환을 완화시키는 효능이 있다(Chen et al. 2014, Kang et al. 2010, Potter et al. 1998). 이소플라본 함량은 품종에 따른 유전적 요인과 재배년도, 재배지역, 온도 등 환경적 요인에 따라 변이가 심하다(Ha et al. 2009, Kim et al. 2012, Lee et al. 2003). 우리나라의 콩 품종은 1913년 이후 지속적인 선발과 교배육종을 통하여 2014년까지 178개의 품종이 등록되었으며 그 이후에도 7개의 품종이 국립종자원에 등록되었다(Lee et al. 2015, https://www.seed.go.kr). 2014년 까지 등록된 품종의 용도별 분포는 장류⋅두부용 53.4%, 나물용 25.8%, 밥밑용 12.9%, 풋콩용이 7.9%를 나타내어 장류⋅두부용과 나물용이 80% 차지하고 있다. 본 연구에서는 고랭지 지대에서 생육과 수량이 우수하여 적응성이 높은 것으로 판단되는 43품종을 선발하였고 이 품종들을 이용하여 고랭지(대관령), 준고랭지(진부) 그리고 평난지(강릉) 지역에서 재배한 후 각 지역별로 콩의 이소플라본 함량을 분석하였다. 따라서, 콩 품종, 재배지역은 물론 콩의 이용용도에 따른 이소플라본 함량 변이를 비교함으로써 고랭지 특화작물로의 활용에 기초자료로 활용될 수 있을 것으로 기대된다. 본 연구의 시험재료는 154 품종을 2015년도에 대관령, 진부, 강릉에서 재배하여 생육과 수량면에서 적응성이 높은 것으로 판단되는 43품종을 사용하였다. 43개 콩 품종은 Table 1과 같다. 개발된 콩 품종과 용도에 따른 이소플라본 함량과의 상관관계를 구명하고자 43개 품종을 Lee et al. (2015)에 의거 장류⋅두부용, 나물용, 밥밑용 그리고 풋콩⋅올콩용으로 구분하여 분석하였다. 시험품종의 용도별 구성은 장류⋅두부용 20개 품종 46.5%, 나물용 11개 품종 25.6%, 밭밑용 4품종, 9.3% 그리고 풋콩⋅올콩용은 8개 품종으로 18.6%를 차지하였다. 선발된 43개 품종은 3개 지역 대관령(해발 800 m), 진부(해발 560 m), 강릉(해발 40 m)에서 재식밀도 80×50 cm, 3반복으로 재배하여 수확하였다. List and their abbreviation of soybean used in this study. Utilization was classified according to Lee et al. (2015). 수확된 콩 종실의 이소플라본 함량 분석은 Zheng et al. (2005)에 준하여 실시하였으며 방법은 다음과 같다. 콩 종실 0.5 g에 1N HCl 15 ml를 첨가한 후 90°C에서 2시간 가수분해 하였다. 그 후 MeOH. 20 ml를 넣고 40°C 암상태에서 2시간 동한 교반하면서 추출하였다. 여과지(Whatman No.2)에 걸러 낸 추출물을 50 ml로 정량하여 UPLC (Waters, Acquity UPLC I-Class, USA)로 분석하였다. 컬럼은 BEH C18 (2.0×50 mm, 17 μm)을 이용하였으며, 시료 주입량은 1 μl였다. 유속은 0.2ml/min이었고 260nm 파장에서 검출하였다. 이동상 A는 0.1% acetic acid (in water), 이동상 B는 acetonitrile를 이용하였다. 품종간 3반복으로 시료를 채취하였으며 Duncan 다중검정은 SAS 9.4 (SAS Institute Inc., Cary, NC, USA)를 이용하여 p<0.05 heat="" map="" kruskal-wallis="" rstudio="" 1="" 1="" 456="" ext-link="" ext-link-type="uri" xlink:href="http://r.rda.go.kr">http://r.rda.go.kr)을 이용하여 분석하였다. 선발된 43개 품종은 대관령 5월 25일, 진부 6월 9일, 강릉 6월 20일에 파종하였다. 지역별 최고⋅최저기온과 파종, 개화기, 성숙기는 Fig. 1과 같다. 대관령에서의 품종별 개화기는 7월 15일에서 8월 12일로 품종간 최대 28일 차이가 났으며 진부에서의 개화기는 7월 18일에서 8월 11일로 품종간 24일 차이가 났다. 강릉에서는 7월 23일에서 8월 13일로 품종간 21일 차이를 보였다. 3개 지역 모두 개화기가 가장 빠른 품종은 ‘석량풋콩’이었고 가장 늦은 품종은 ‘풍산나물콩’이었다. Meteorological condition of high (H) and low (L) air temperature of 3 cultivation areas. Sowing date, flowering time and maturation period from three cultivation areas are indicated by arrows. (DG: Daegwallyeong, JB: Jinbu, GN: Gangneung). 개화기에서 성숙기까지의 소요일수는 61~79일로 지역간 차이는 없었으나, 이 기간중의 적산온도는 대관령 1,297°C, 진부 1,391°C, 강릉 1,685°C를 보여 지역간 차이가 컸다(Table 2). 그러나, 전 생육기간 중 적산온도가 2,000°C 이상을 나타내어 3개 지역에서 콩의 경제적 재배가 가능할 것으로 판단되었다(대관령: 2,450°C, 진부: 2,444°C, 강릉: 2,675°C). Days from flowering to maturing and their accumulative temperature during cultivation according to utilization of 43 soybean cultivars. 선발된 43개 품종을 장류⋅두부용, 나물용, 밥밑용 그리고 풋콩⋅올콩용으로 구분하여 용도별로 이소플라본 함량을 비교하였다. 장류⋅두부용 콩 20개 품종의 이소플라본 함량은 Table 3과 같다. ‘장올’을 비롯한 20개 품종의 이소플라본 함량은 2,579 μg/g 이었으며 이를 지역별로 보면 진부 2,542 μg/g, 그리고 강릉 2,288 μg/g이었다. 품종별로는 8품종이 대관령에서 3,000 μg/g 이상을 나타내었으며, 그 중 ‘팔달콩’이 4,783 μg/g로 가장 높았으며 ‘신팔달2호’, ‘일미콩’, ‘신팔달콩’, ‘대풍’ 5개 품종이 4,000 μg/g 이상을 나타내었다. 진부에서는 6품종이 3,000 μg/g 이상을 보였으며 ‘대풍’이 4,155 μg/g으로 가장 높게 나타났다. 강릉에서는 4품종이 3,000 μg/g 이상을 나타내었고 4,000 μg/g 이상의 이소플라본 함량을 보이는 품종은 없었다. Isoflavone contents and significance of soybean for soy sauce and tofu grown in 3 cultivation areas. Mean values in the same column with different superscript small letter are significantly different between varieties (p<0.05). 나물용콩의 이소플라본 함량은 Table 4와 같다. L29를 비롯하여 11개 품종의 이소플라본 함량 평균은 2,518 μg/g 이었으며, 지역별로는 대관령 2,731 μg/g, 진부 2,416 μg/g, 강릉 2,408 μg/g을 나타내었다. 품종별로는 대관령에서 3품종이 3,000 μg/g 이상을 보였으며, L29는 4,215 μg/g 로 가장 높게 나타났다. 진부와 강릉에서는 4,000 μg/g 이상을 보이는 품종이 없었으며, 진부에서는 2개품종(‘새별콩’, ‘L29’)이, 강릉에서는 3품종(‘L29’, ‘푸른콩’, ‘호서’)이 3,000 μg/g 이상을 보였다. Isoflavone contents and significance of soybean for bean sprout grown in 3 cultivation areas. 밥밑용콩의 이소플라본 함량 비교는 Table 5와 같다. ‘중모3002’를 비롯하여 4개 품종의 이소플라본 함량을 비교하였다. 3개 지역의 평균 이소플라본 함량은 1,886 μg/g 이었으며, 각 지역별로 대관령 2,069 μg/g, 진부 1,527 μg/g, 그리고 강릉 2,061 μg/g을 보였다. 대관령과 진부에서는 3,000 μg/g 이상을 보이는 품종이 없었으며 강릉에서 ‘흑성’이 3,437 μg/g으로 가장 높게 나타났다. 그러나, 이번 결과는 1년치 자료로 ‘흑성’에 대한 추가 분석이 필요할 것으로 보인다. Isoflavone contents and significance of soybean for cooking with rice grown in 3 cultivation areas. ‘석량풋콩’을 포함하여 풋콩⋅올콩류 8품종의 이소플라본 함량 비교는 Table 6과 같다. 3개 지역의 평균 이소플라본 함량은 1,101 μg/g 이었으며 지역별로는 대관령 1,414 μg/g, 진부 935 μg/g, 그리고 강릉 953 μg/g을 보였다. 풋콩⋅올콩류의 경우 3개지역 모두 3,000 μg/g 이상을 보이는 품종이 없었다. Isoflavone contents and significance of soybean for vegetable and early maturity grown in 3 cultivation areas. 4개 용도의 지역간 이소플라본 함량은 대관령이 가장 높았다. 3,000 μg/g 이상의 비율을 보면 대관령 28%, 진부 18%, 강릉이 19%를 나타내었다. Heat map을 이용하여 콩의 이용용도와 재배지역에 따른 이소플라본 함량 변이를 품종별로 비교하였다(Fig. 2). 시험에 이용된 43개 품종은 이소플라본 함량이 높은 group1, 낮은 group2, 그리고 중간에 포함되는 group3으로 구분하였다. Fig. 2의 heat map은 Fig. 3의 그룹과 같은 결과를 보였다. 이소플라본 함량이 높은 group1은 12개 품종이 포함되었다. 용도에 따라 장류⋅두부용 8품종(67%), 나물용 4품종(33%)으로 나뉘어졌다. 이소플라본 함량이 낮은 gruup2에는 17개 품종이 포함되었다. 용도별로는 풋콩⋅올콩류 8품종(47%)으로 가장 많았고, 장류⋅두부용이 5품종(29%), 그리고 나물용과 밥밑용이 2품종씩(12%)을 나타내었다. Group3의 14품종에는 장류⋅두부용 7품종(50%), 나물용 5품종(36%), 그리고 밥밑용 2품종(14%)이 포함되었다. 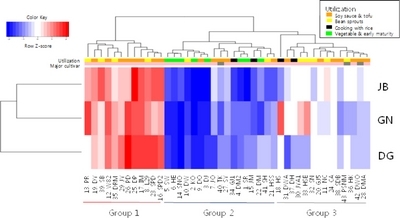 Heat map shows isoflavone contents. The top 2 rows represent utilization for soybean and the bottom 3 rows represent total isoflavone contents between 3 cultivation areas and 43 soybean cultivars. Red color represents high concentration and blue color represents low concentration (DG: Daegwallyeong , JB: Jinbu, GN: Gangneung). Scatterplot of total isoflavone contents between two areas. A: Gangneung (GN) vs Daegwallyeong (DG), B: Gangneung (GN) vs Jinbu (JB). Kim & Chung (2007)은 콩 종자가 발달하는 단계에 따라 이소플라본 함량 변화를 비교하였다. 종자형성 개시기(R5), 초록의 완전한 크기로 자라는 시기(R6), 그리고 완전히 성숙된 시기(R7)로 구분하였을 때 이소플라본 함량은 R7단계에서 가장 높고 R6, R5 순서였으며, Kitamura et al. (1991)은 올콩이 상대적으로 이소플라본 함량이 낮다고 보고하였다. 이는 이번 용도별 비교에서 다른 용도에 비하여 풋콩⋅올콩용의 이소플라본 함량이 적은 것과 일치하는 결과이다. Fig. 3은 43개 품종에 대하여 강릉과 대관령, 강릉과 진부에서의 이소플라본 함량을 변수로 하여 좌평면상에 점으로 표시하여 나타낸 것이다. Fig. 2에서 나타난 3개의 그룹이 시각화 되어 쉽게 구분이 가능하다. Fig. 3A의 강릉과 대관령의 비교에서 점선을 기준으로 36개 품종이 강릉에 비하여 대관령에서 이소플라본 함량이 높았다. 그러나, Fig. 3B의 경우 강릉과 진부와의 비교에서 25개 품종이 강릉에 비하여 진부에서 이소플라본 함량이 높았다. 이는 Fig. 4의 Kruskal-wallis test를 보면 강릉(2,049 μg/g)과 대관령(2,506 μg/g)간 이소플라본 함량 비교에서 p=0.061을 나타내어 유의수준 0.1에서 귀무가설이 기각되어 유의차가 인정된 것과 강릉(2,049 μg/g)과 진부(2,117 μg/g)의 비교에서는 p=0.74로 유의수준 0.1에서 귀무가설이 채택되어 유의차가 인정되지 않은 것과 유사한 결과이다. 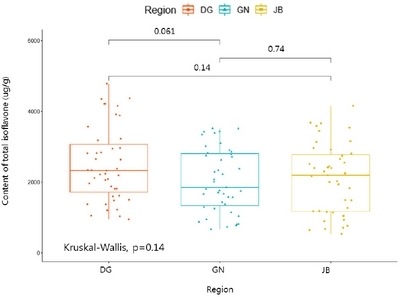 Kruskal-Wallis test for total isoflavone contents and 3 cultivation areas (DG: Daegwallyeong , JB: Jinbu, GN: Gangneung). 콩의 이소플라본 함량은 유전적으로 결정되지만 재배환경 조건에 많은 영향을 받는다(Carrão-Panizzi et al. 1999). 이번 연구에 이용된 43개 품종에서 대관령 지역에서 높은 함량을 나타낸 품종이 31개로 재배 환경조건에 영향을 받는다는 Carrão-Panizzi et al. (1999)의 연구를 뒷받침하고 있다. 대관령의 재배기간 중 평균온도는 16.7°C였으며 강릉은 21.4°C였다. 특히 등숙기의 저온은 이소플라본 함량에 큰 영향을 끼치는데(Tsukamoto et al. 1995), 등숙기간 중 평균 최저기온이 대관령 6.2°C, 진부 8.5°C, 강릉 12.5°C로 대관령 재배콩의 이소플라본 함량이 다른 지역에 비하여 높음을 뒷받침해주고 있다. 그러나 고랭지인 대관령보다 준고랭지인 진부에서 이소플라본 함량이 높은 품종은 ‘장올’을 비롯하여 6품종(‘대망’, ‘선녹’, ‘황금콩’, ‘대흑’, ‘새별콩’)이었으며 평난지인 강릉에서 이소플라본 함량이 높은 품종은 ‘푸른콩’ 등 4품종(‘조항1호’, ‘호서’, ‘대왕콩’)이 포함되었다. 이는 Ok et al. (2008)에 의하면 대관령과 진부의 이소플라본 함량 비교에서 기온이 더 높은 진부에서 함량이 증가된 결과와 유사하다. 이는 이소플라본 함량이 저온뿐만 아니라 과습이나 건조스트레스, 토양 비옥도, 일조시간 등 다양한 요인에 영향을 받으므로 이에 대한 추가 연구가 필요할 것으로 생각되었다. 3개 지역의 이소플라본 함량을 비교한 결과 3,000 μg/g 이상을 나타내는 품종이 강릉 8품종, 진부 8품종, 대관령 11품종이었다. 이 가운데 3개 지역 모두에서 이소플라본 함량이 3,000 μg/g 이상을 나타낸 품종은 4품종(‘L29’, ‘Williams 82’, ‘일미콩’, ‘대풍’)으로 유전 및 환경적 요인에 안정적인 경향을 보였다. 준고랭지와 고랭지인 진부와 대관령 2지역에서 3,000 μg/g 이상을 동시에 보이는 품종은 위의 3개 지역에서 높은 함량을 나타낸 4품종과 함께 ‘두유콩’, ‘신팔달 2호’, ‘신팔달콩’ 그리고 ‘새별콩’을 포함하여 8품종이다. 특히 고랭지인 대관령에서만 3,000 μg/g 이상을 보인 ‘장연콩’과 ‘도레미콩’, 그리고 평난지인 강릉에서만 3,000 μg/g을 보인 ‘푸른콩’, ‘흑성’, ‘호서’는 환경적 요인에 크게 영향을 받는 것으로 보인다. ‘팔달콩’의 경우 대관령에서 4,783 μg/g으로 최대 함량을 보였으나 진부에서 ‘2,926 μg/g을 보여 재배지역 간 큰 변이를 보여 추가적인 요인분석이 필요하다. 우리나라의 콩 재배에 이용되는 주요 품종은 종자 공급량을 기준으로 ‘대원콩’ 73%, ‘풍산나물콩’ 12%, ‘태광콩’ 8%로 이 세 품종이 93%를 차지하고 있다(www.krei.re.kr). 이 세 품종의 이소플라본 함량은 ‘대원콩’ 2,129 μg/g, ‘풍산나물콩’ 2,257 μg/g, ‘태광콩’ 1,683 μg/g을 보였다. 반면에 ‘대풍’ 3,919 μg/g, ‘일미콩’ 3,797 μg/g, 그리고 ‘팔달콩’은 3,740 μg/g을 나타내었다. 이를 토대로 장류⋅두부용이거나, 육성과정에 ‘대풍콩’이나 ‘일미콩’을 모계나 부계로 이용하여 이소플라본 함량이 높은 콩 육종을 위한 기초자료로 이용할 수 있을 것이다. 고랭지 적응성이 우수한 43개 품종을 이용한 지역별 생육특성과 이소플라본 함량을 비교한 결과를 토대로 콩 육종의 기초자료로의 이용과 재배지역에 따라 품종 선택을 통해 콩의 기능성을 특화할 수 있는 가능성을 보였다. 본 연구에서는 고랭지 적응성이 우수한 43개 콩 품종을 대상으로 각 지역별 생육특성과 이소플라본 함량 변이를 분석하였다. 재배 지대별 개화기는 대관령 7월 15일에서 8월 12일, 진부 7월 18일에서 8월 11일 그리고 강릉에서 7월 23일에서 8월 13일 이었다. 또한 개화기에서 성숙기까지의 소요일수는 61~79일 이었으며 이 기간중의 적산온도는 대관령 1,297°C, 진부 1,391°C, 강릉 1,685°C로 나타났으며 3지역 모두 전 재배기간 중의 적산온도가 2,000°C 이상으로 경제적 콩 재배가 가능할 것으로 판단되었다. 43개 품종을 장류⋅두부용, 나물용, 밥밑용 그리고 풋콩⋅올콩용으로 구분하여 이소플라본 함량을 분석하였을 때 평균 이소플라본 함량은 장류⋅두부용 2,579 μg/g으로 높게 나타내었다. 품종별 이소플라본 함량 비교에서 대관령에서 재배된 ‘팔달콩’, ‘신팔달2호’, ‘일미콩’, ‘신팔달콩’, ‘대풍’ 5품종이 4,000 μg/g 이상을 보였다. 지역간 이소플라본 함량은 강릉과 대관령간 비교에서 p=0.061로 유의수준 0.1에서 유의차가 인정되었으며 강릉과 진부 간에서는 유의차가 인정되지 않았다. 이는 재배기간 중 특히 성숙기의 저온이 이소플라본 함량에 영향을 끼친 것으로 판단된다. 대관령, 진부, 강릉 3개 지역에서 3,000 μg/g 이상의 이소플라본 함량을 보이는 품종은 ‘L29’, ‘Williams 82’, ‘일미콩’, ‘대풍’으로 유전 및 환경적으로 안정된 경향을 보였다. 이번 연구를 통하여 콩의 기능성 육종과 지역별 품종선택에 있어서 기초자료로 이용할 수 있을 것이며 고지대에서의 콩 재배 확대에 기여할 것으로 기대된다. 본 논문은 농촌진흥청 국립식량과학원 시험연구사업(과제번호: PJ01125904)의 지원에 의해 이루어졌다. Carrão-Panizzi MC, Beléia ADP, Kitamura K, and Oliveira MCN. Effects of genetics and environment on isoflavone content of soybean from different regions of Brazil. Pesq Agropec Bras Brasilia 1999;34:1787-1795. Chen M, Rao Y, Zheng Y, Wei S, Li Y, Guo T, and Yin P. Association between soy isoflavone intake and breast cancer risk for pre- and post-menopausal women: A meta- analysis of epidemiological studies. PLOS ONE 2014;9:1-10. Dixon RA, and Paiva NL. Stress-induced phenoylpropanoid metabolism. The Plant Cell 1995;7:1085-1097. Goss MJ, Varennes A, Smith PS, and Ferguson JA. N2 fixation by soybeans grown with different levels of mineral nitrogen, and the fertilizer replacement value for a following crop. Can J Soil Sci 2002;82:139-145. 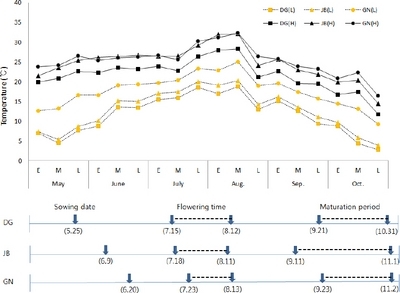 Ha TJ, Lee JH, Shin SO, Shin SH, Kan SI, Kim HT, Ko JM, Lee MH, and Park KY. Changes in anthocyanin and isoflavone concentrations in black seed-coated soybean at different planting locations. J Crop Sci Biotech 2009;12:79-86. Kang X, Zhang Q, Wang S, Huang X, and Jin S. Effect of soy isoflavones on breast cancer recurrence and death for patients receiving adjuvant endocrine therapy. CMAJ 2010;182:1857-1862. Kim EH, Kim SL, Kim SH, and Chung IM. Comparison of isoflavones and anthocyanins in soybean [Glycine max(L) Merrill] seeds of different planting dates. J Agric Food Chem 2012;6:10196-10202. Kim JA, and Chung IM. Change in isoflavone concentration of soybean (Glycine maxL.) seeds at different growth stages. J Sci Food Agric 2007;87:496-503. Kitamura K, Jetta K, Kikuchi A, Kudou S, and Okubo K. Low isoflavone content in some early maturing cultivars, so-called “Summer-type soybean”(Glycine max(L) Merrill). Jpn J Breed 1991;41:651-654. Lee C, Chon MS, Kim HT, Yun HT, Lee B, Chung YS, Kim RW, and Chon HK. Soybean [Glycine max(L.) Merrill]: Importance as a crop and pedigree reconstruction of Korean varieties. Plant Breed Biotech 2015;3:179-196. Lee SJ, Yan WK, Ahn JK, and Chung IM. Effect of year, site, genotype and their interactions on various soybean isoflavones. Field Crop Res 2003;81:181-192. O&apos;Keefe S, Bianchi L, and Sharman J. Soybean nutrition. SM J Nutr Metab 2015;1:1006. Ok HC, Yoon YH, Jeong JC, Hur OS, Lee CW, Kim CG, and Cho HM. Yields and isoflavone contents of soybean cultivar in highland area. Korean J Crop Sci 2008;53:102-109. Potter SM, Baum JA, Teng H, Stillman RJ, Shay NF, and Erdman JW. Soy protein and isoflavones: their effects on blood lipids and bone density in postmenopausal women1-3. Am J Clin Nutr 1998;68:1375S-9S. Rodríguez-Navarro DN, Margaret Oliver I, Albareda Contreras M, and Ruiz-Sainz JE. Soybean interactions with soil microbes, agronomical and molecular aspects. Agron Sustain 2011;31:173-190. Tsukamoto C, Shimada S, Igita K, Kudou S, Kokubun M, Okubo K, and Kitamura K. Factors affecting isoflavones content in soybean seeds: changes in isoflavones, saponins, and composition of fatty acids at different temperatures during seed development. J Agric Food Chem 1995;43:1184-1192. Zheng J, Jin Y, and Row KH. Analysis of isoflavones from Korea and Chinese soybean and processed products by HPLC. J Kor Chem Soc 2005;49:349-354.